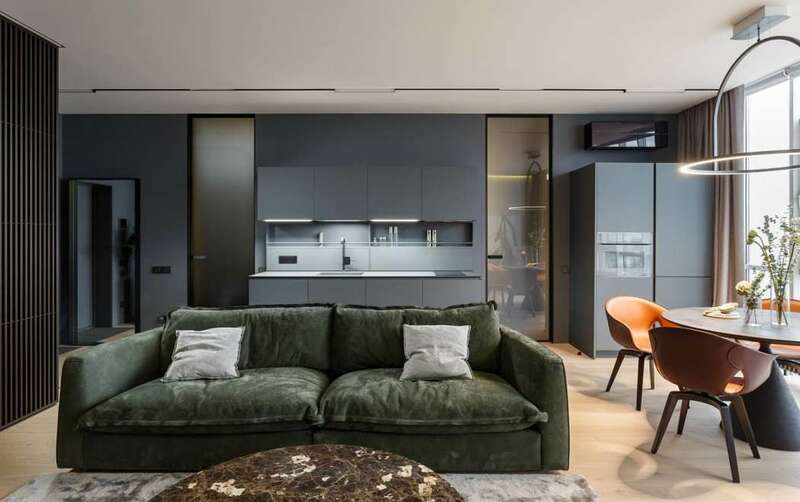 Located in Odesa, Ukraine, this timeless apartment featuring a panoramic Black Sea view was designed by Svoya Studio. Free layout and admire panoramic Black Sea view were the initial data for the design concept of apartment with area of 69 m 2 in Odessa City. The latest became a reference point of interior concept. The main focusing is on panoramic view and interior shall be a framework of exterior. Apartments are specified for life and relaxing of the owner of an apartment. The attention is drawn to comfort and high quality of all space elements. Role in the preparation of food is quite conditional. This enabled transit accommodation of Poliform kitchen with all necessary elements which resulted in visual increased space. The studio includes Rimadesio dressing-room. It is individually designed taking into account two-way orientation. Access is provided from entry way and sitting room. Technical storage room is located near, outside the apartment, which allowed not to occupy too much space. Comfort is presented by comfortable and ergonomic furniture. The central location of the Baxter sofa allowed to zone the space and open the best views from the sofa. The dining area with radial elements of furniture and lighting looks spectacular at any time of day or night. Despite the small area the bedroom is comfortable with the orientation of bed towards sea.